Ubuntu Studio is a multimedia editing/creation flavour of Ubuntu. It’s built for the GNU/Linux audio, video, and graphic enthusiast or professional. Because I don’t do audio, video and graphic editing or creation, so I didn’t install Ubuntu Studio. But from the screenshot, I really like the theme that is used by Ubuntu Studio. So I decide to install the theme into my Feisty Fawn. Here I attached a file that contains deb packages for ubuntustudio-theme, ubuntustudio-icon-theme, ubuntustudio-wallpapers and gtk2-engines-murrine (required by ubuntustudio-theme). For you who use Dapper or Edgy or maybe who use 64bit can try that file to install Ubuntu Studio theme. For you running Edgy Eft please use this gtk2-engines-murrine_0.30.2-1_i386.deb than the one provided in the file above. Thanks to ragingmon! Too bad theres no AMD64 package for those :S, or am I wrong? I already did this before, but Ubuntustudio’s theme is just great. I think you don’t need AMD64 packages just to install themes. But if you reffering to Ubuntu Studio for AMD64, the Ubuntu Studio developers said that it could be available in the future. Thanks a lot for the post; this theme is slick! Ok, now how do I fully uninstall it . Anyone tried this on Kubuntu? Hello and thanks a lot for this! I had been trying to find a way to get ubuntustudio look. Cannot write to `ubuntustudio.gpg’ (Broken pipe). Any idea why this happens? Sorry I’m still a bit new to Ubuntu. have u tried these tips for edgy? good tutuorial, coz i don’t really want to install ubuntu studio fully, just the themes. Hmm, apt is complaining because it can find the amd64 bit packages. Apt shouldn’t be crapping completely out on the repo for that, should it? Hi, it seemed OK at first, but not all colors where correct, for instance the font color on the menu-bars. So I switched back to the default theme. But then it all froze, and I can’t get back into Gnome. Luckily I mainly use Fluxbox so I can use my computer, but does anyone know how to fix this? The only difference I did was that I used aptitude instead of apt-get, but I can’t understand that would make Gnome freeze. Version of libatk1.0-0 on system is 1.11.4-0ubuntu1. Version of libc6 on system is 2.3.6-0ubuntu20.4. Version of libcairo2 on system is 1.0.4-0ubuntu1. Version of libfontconfig1 on system is 2.3.2-1.1ubuntu12. Version of libglib2.0-0 on system is 2.10.3-0ubuntu1. Version of libgtk2.0-0 on system is 2.8.20-0ubuntu1.1. Version of libpango1.0-0 on system is 1.12.3-0ubuntu3. Version of libxfixes3 on system is 1:3.0.1.2-0ubuntu3. Version of libxrandr2 on system is 1:1.1.0.2-0ubuntu4. ok I’ve fixed it.. I’m using edgy..
and I don’t like the Window Borders of Ubuntu Studio, some panels are not looking good. So I downloaded and intalled the Neutronium Theme..
thanks for the workaround. I can’t test it in Edgy because I don’t have a machine that running Edgy. i don’t like the window heading/title of ubuntustudio (why is it colored blue??) so thanks for the suggesting Neutronium. Wow! Great to find a post with such a clear meagsse! It’s good. i have installed it in my system. Think you. I use 64 bit, so I had to use the package manager to install gtk2-engines-murrine. then the other three installed. i was able to get the wallpaper up, but i can’t figure out how to get the theme it self to launch to change the icons. Can you give me a hint? For the 1st method, I think you skip the step 2 so it didn’t find the gpg key. For changing the icons, you can go to System -> Preferences -> Theme, and then click on Customize, you will see an “Icons” tab in there, select it and choose your desirable icons set. Mmmm awesome I love it. Very nice. Thanks for the walkthrough. Hmm, I’m a little stuck. I’ve followed the instructions (installed the separate packages, not not the whole ubuntustudio-look), but when I go to System -> Preferences -> Themes, I don’t see the Ubuntu Studio one there anywhere! Is there something else I need to do? I installed ubuntustudio-theme, ubuntustudio-wallpapers, and ubuntustudio-icon-theme. In case anybody else gets stuck, I simply customized a theme, choosing UbuntuStudio for the controls, icons, window borders, etc. I really like this theme! 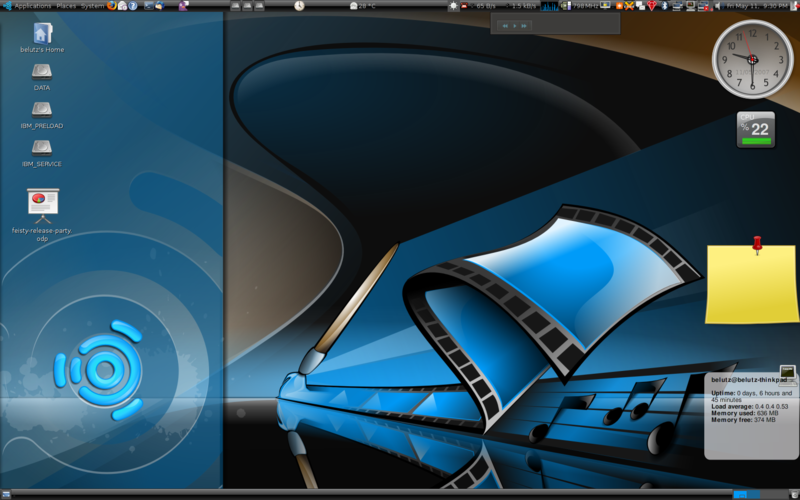 Heres a great theme I discovered on Gnome-look which gives you the vista glass effect over Gnome. Though with some digging I noticed that I could change an existing theme to use elements of the Ubuntu Studio theme. This forces me to manually choose the colors and everything – defeating the purpose of themes. How do I get Ubuntu Studio to be a theme in the Themes list, rather than an option to customize an existing theme? Thanks for the great tip! Awesome theme!